For the past two years, the University of Hawaii Sea Grant Program has been recruiting citizen scientists from across the Pacific. 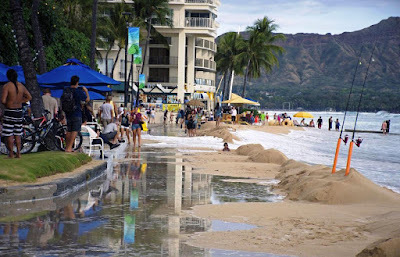 They were trained to document high water levels or King Tides in an effort to understand and adapt to sea level rise. Hawaii Public Radio. State Auditor’s report blasts energy office. The Hawaii State Energy Office awarded a contract for more than $250,000 to plan a “state-of-the-art” energy innovation center last year, and then seven months later commissioned another consultant to assess whether that center is actually needed, according to an audit of the office. Star-Advertiser. Auditors couldn't figure out what this state office does — or plans to do. Hawaii News Now. Audit: State Energy Office ‘Is Not Doing Its Job’ A scathing report cites the office’s failure to document what it’s doing to help Hawaii’s transition to renewable energy resources. Civil Beat. 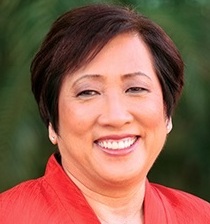 Why Colleen Hanabusa Can’t Sit Still. The Hawaii congresswoman talks about ambition, office-hopping and her quest for the Hawaii governor’s office. Civil Beat. BOSS Asks Business Leaders: Ige or Hanabusa? Hawaii Business. Kenji Price — a former federal prosecutor and Army Ranger who is now a director at the Honolulu law firm of Alston Hunt Floyd & Ing — has been appointed Interim U.S. Attorney for Hawaii by Attorney General Jeff Sessions, the Justice Department announced today. Star-Advertiser. Ex-Army Ranger Named Temporary US Attorney For Hawaii. Kenji Price has been focusing on white collar criminal defense and commercial litigation at a Honolulu firm. Associated Press. Delays in clinic inspections hurt dialysis patients. Lawmakers are trying to find solutions to a three-year delay in inspections for some dialysis clinics that largely remain closed as the number of residents with kidney failure continues to climb. Star-Advertiser. One aspect of the homeless crisis: State realizes policing encampments is pricey. DLNR is requesting $330,000 in related funds. Gov. David Ige's administration also wants $419,302 to pay for eight new deputy sheriffs that could respond to complaints about illegal camping and trespassing on state lands. There is also a $5 million lump sum request in the state Department of Human Services' budget. Hawaii News Now. Hawaii joins 'tele-abortion' pilot amid debate about procedure's safety. Hawaii is one of only four states taking part in a "tele-abortion" pilot project, and the politically-charged issue is riling up abortion foes. Hawaii News Now. Preschool Open Door Program Open for Enrollment. Low and moderate-income families in Hawaii can tap a state subsidized program to give their keiki a head start in early learning. Hawaii Public Radio. No end in sight for mumps outbreak. In addition to containing clusters of mumps cases, the state is gearing up for the peak of flu season. KITV. Mumps booster needed to avoid virus. Even if you had a mumps vaccination, you are being urged to get a booster shot. KITV. Foreign fishermen settle human trafficking suit. Two Indonesian fishermen who say they were enslaved on an American fishing boat have settled their lawsuit against the vessel’s owner seven years after escaping and receiving special U.S. visas as victims of human trafficking. Associated Press. Kmart to pay over $84K for overbilling Hawaii Medicaid customers. Pacific Business News. Hawaiian Airlines awarded share of $227M federal contract. Hawaiian Airlines Inc. on Friday received a share of a $227 million federal contract for international commercial scheduled air cargo transportation services. Pacific Business News. Katherine Kealoha coerced man to lie to grand jury, charges say. The deputy city prosecutor wife of a Honolulu police chief convinced a man whose trust she allegedly stole from when he was a child to lie for her before a grand jury looking into corruption allegations against the couple, according to court documents filed today. Associated Press. An alleged victim in the case against former Honolulu police chief Louis Kealoha and his deputy prosecutor wife, Katherine, is now a suspect. KHON2. Police Commission Loosens Rules On Legal Fees For Officers. For years, city attorneys have been strict when it comes to paying an officer’s attorney fees in lawsuits and criminal complaints. Civil Beat. Rise in attacks by state hospital patients prompts call for change. KHON2. Medical Pot And Veterans: Groups Offer Free Evaluations. The cost of getting evaluated usually far exceeds the price of the actual registration process for cannabis users. Civil Beat. Honolulu EMS announces the need for more money. KHON2. Warning signs posted after big sewage spill into Kaneohe Bay. The public is being told to stay out of Kaneohe Bay after a spill sent 30,000 gallons of sewage into the water. Hawaii News Now. Kaimana the monk seal is hooked again. Kaimana the monk seal got hooked — a second time. This time, she needed help getting it out. Star-Advertiser. $500K-plus micro condo units to hit Kakaako market. About 200 studios range from 277 square feet to 373 square feet, with the smallest of those starting between $500,000 and $600,000. Star-Advertiser. Howard Hughes to open sales office for new Honolulu tower. Pacific Business News. Petitioners want to preserve monkeypod trees at Manoa Marketplace. Star-Advertiser. Ige releases additional $1.3M for outreach, research in battle against rapid ohia death. Tribune-Herald. Mayor Harry Kim’s lobbyist to the state Legislature appeared before a more local body Wednesday, where he defended his track record and pledged better communication with the County Council. 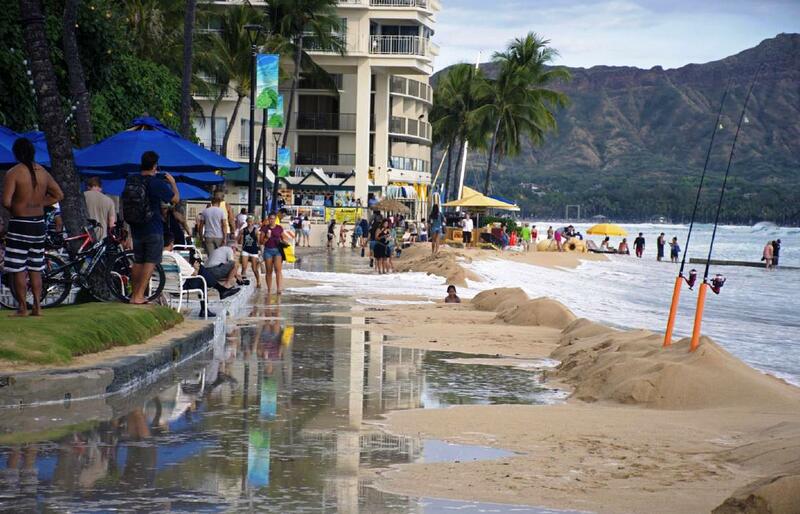 West Hawaii Today. The traffic signals are in place, but it may take until the end of the month before intersection improvements at Shower Drive and Highway 130 in Puna are complete. Tribune-Herald. A former driver for The Arc of Hilo who sexually assaulted a physically and mentally disabled woman last year in a van owned by the nonprofit organization was sentenced Wednesday to 20 years in prison. Tribune-Herald. Makawao is Highest Priority Area for Cesspools, Public Meeting Announced. Maui Now. Water Director Taylor remains at home. Water Department leadership in limbo following council vote in support of director. Maui News. Rats! signs of life. A rapid assessment team flew to Lehua Island Tuesday after checks of motion-detecting field cameras showed the presence of two rats. Garden Island. Housing crisis lingers as additional rental unit bill deferred. A bill aimed at allowing homeowners to build small rental units on their land in order to help meet an affordable housing shortage was deferred to the end of February during a Kauai County committee meeting Wednesday. Garden Island.